The Jewish community of Athens is hardly thirty years old. One of the oldest families, if not the oldest, is that of Max Rothschild, a Bavarian Jew, who went to Greece in 1833 with King Otho. The community had neither synagogue nor rabbi, but a Turkish "ḥakam" held services in very unsuitable quarters. The majority of the Athenian Jews are of Levantine-Spanish extraction, and reside close together; they are mostly artisans or pedlers. Those in better circumstances are mainly of German descent, though some of those from Chalcis and Zante have means. 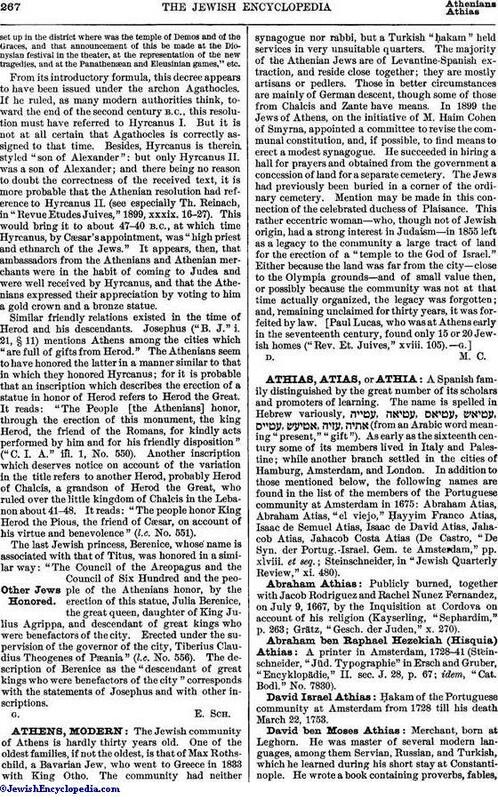 In 1899 the Jews of Athens, on the initiative of M. Haim Cohen of Smyrna, appointed a committee to revise the communal constitution, and, if possible, to find means to erect a modest synagogue. He succeeded in hiring a hall for prayers and obtained from the government a concession of land for a separate cemetery. The Jews had previously been buried in a corner of the ordinary cemetery. Mention may be made in this connection of the celebrated duchess of Plaisance. This rather eccentric woman—who, though not of Jewish origin, had a strong interest in Judaism—in 1855 left as a legacy to the community a large tract of land for the erection of a "temple to the God of Israel." Either because the land was far from the city—close to the Olympia grounds—and of small value then, or possibly because the community was not at that time actually organized, the legacy was forgotten; and, remaining unclaimed for thirty years, it was forfeited by law. [Paul Lucas, who was at Athens early in the seventeenth century, found only 15 or 20 Jewish homes ("Rev. Et. Juives," xviii. 105).